Here�s a bright little friend to dress up your living room kitchen or patio. 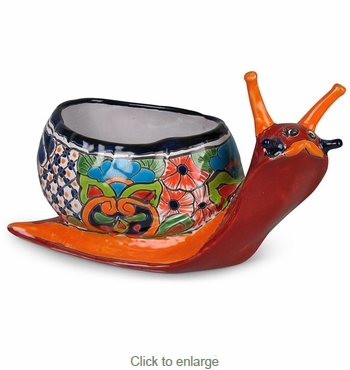 This Talavera snail planter makes the perfect home for anything from herbs to violets. This whimsical pot is hand crafted and hand painted in traditional Talavera designs and will fit in to any home d�cor. Traditional Assortment: The design shown is of the Traditional Talavera style. Your snail planter will be chosen from our current assortment of available colors and designs. The item you receive will likely be different than pictured here.